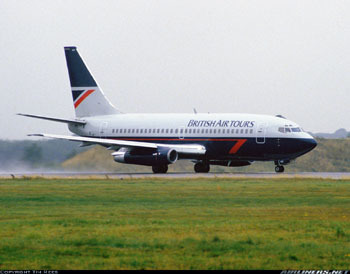 British Airtours Flight KT28M, a Boeing Model 737-200 series airplane, was taking off from Runway 24 at Manchester International Airport, Manchester, UK, when the left engine experienced an engine failure. The flightcrew aborted the takeoff, and thinking the airplane had suffered from a tire burst, taxied the airplane clear of runway 24. In fact, a piece of the left engine combustor had penetrated a fuel-tank access panel, causing an uncontrollable fuel spill. The captain called for an evacuation; however, the fuel ignited and, accelerated by the adverse positioning of the airplane relative to the wind, the airplane was burned severely. Fifty-five passengers perished as a result. The British Civil Aviation Authority (CAA) determined the cause of the accident (fuel spill/ensuing fire) was an engine failure caused by faulty repairs; fragments from that engine failure penetrating a fuel-tank access door insufficiently constructed to withstand the impact from the failed engine pieces.